Fall is my favorite time of year, too bad it whizzes by so fast! Did you know Thanksgiving is just a few weeks away! Our All-American holiday will be here before we know it. If you are hosting Thanksgiving now is the time to start preparing! I’ve compiled some of StoneGable’s best Thanksgiving tablescapes, diy’s, easy decorating ideas and one very special tips that will ROCK YOUR THANKSGIVING WORLD! I’ve picked eight posts that will inspire and help you make this Thanksgiving a memorable one! Let’s make this a beautiful, fun and family-oriented Thanksgiving! THE BEST THANKSGIVING TIP YOU WILL EVER GET! If you are hosting Thanksgiving this year you must read THE BEST THANKSGIVING TIP YOU WILL EVER GET! 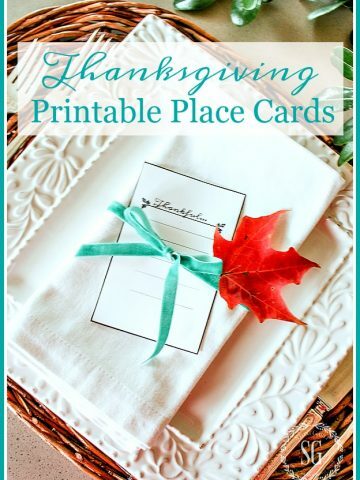 And if you know someone who is hosting Thanksgiving this year send this post to them! I think Thanksgiving is the most work intensive meal of the year. 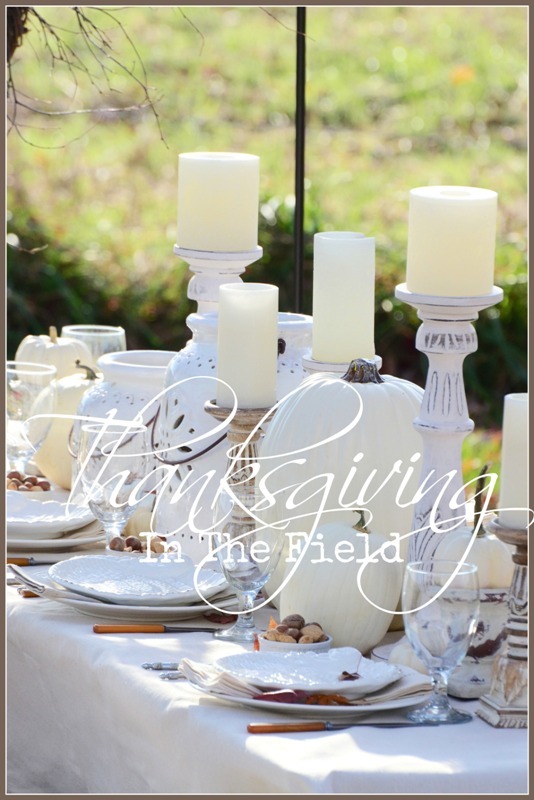 But with this tip… this one MAGICAL tips Thanksgiving can be a fabulous, fun group effort! It’s all about the “dishpans”! If you read one thing in this post this is it!!!! 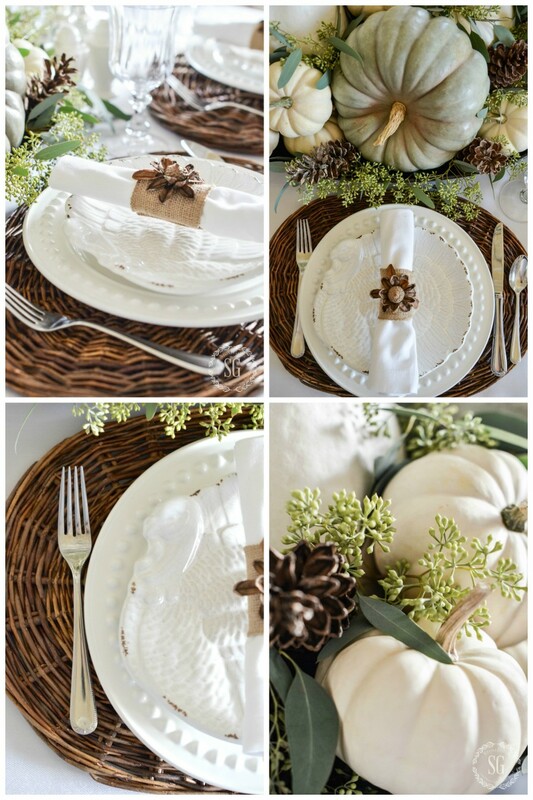 There are so many easy-to-do, smart and inspiring ideas for setting a Thanksgiving table in this post. You may not dine al fresco this year, but many of the ideas can be transferred inside! Don’t you love easy-peasy decorating! This vignette would look so good as a centerpiece on a table too! And can I tell you a little secret… it took less than 10 minutes to put together! 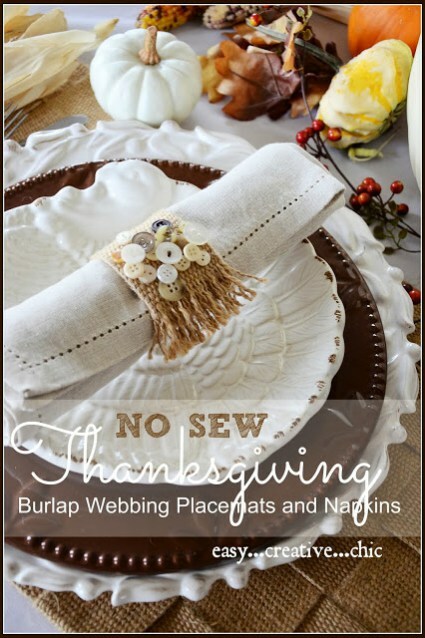 Have you thought of making your own place mats or napkin rings for a Thanksgiving table? These are no-sew and so easy! I have tons of buttons so I embellished the burlap webbing napkin rings with them. Do you have any Thanksgiving traditions? Many families do. We tell a very special Thanksgiving story and use 5 kernels of Indian corn to count our blessing around the Thanksgiving table every year! If you want a way to connect with the one’s you love on Thanksgiving day this might be a good way to do it! It just would not be Thanksgiving at our home without the five kernels of Indian corn. Here’s another Thanksgiving table to inspire you! This one is full of soft, colors! The take away from this table is to use seeded Eucalyptus to run down the center of the table! It smells fabulous too! I like to order a few bunches so I have it a couple days before I need to set my table! And don’t forget to use pinecones as filler. They add lots of interest to a table! Another napkin ring idea for your Thanksgiving table. Isn’t this flower pretty? I use the set I made all fall long! 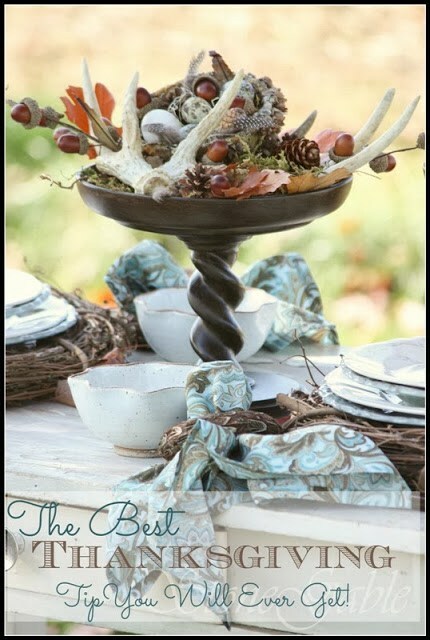 A Thanksgiving centerpiece does not have to be time consuming and complicated! In fact, it should really be quite easy! Here’s a centerpiece that uses pumpkins, seeded eucalyptus and candles! 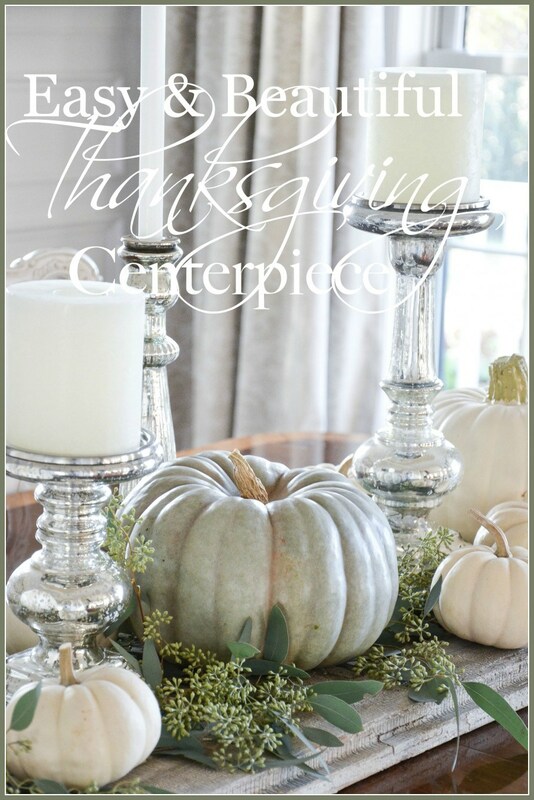 Create a Thanksgiving centerpiece that your guests will ooooh and aaaah over! 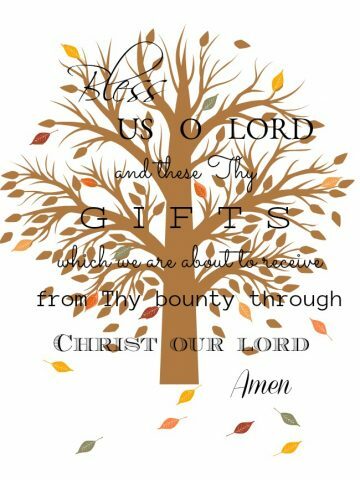 I hope you visit each of these Thanksgiving posts and find lots of ideas to use for your Thanksgiving table! Next week I’ll be sharing some great recipes that would be perfect to serve as part of your Thanksgiving meal! You might like to follow me on Pinterest and see all the great things I am finding to pin HERE. I just found you on Pinterest! Love all of these tablescapes! I’m planning to do something similar with eucalyptus and white pumpkins. I love the wicker (?) chargers in your picture. Will you tell me about them and where you purchased? Thank you so much. I found them at our local Pottery Barn outlet years ago. Please tell me where I can buy the white turkey said plates and the salt/white salt/pepper shakers on your “soft and natural Thanksgiving tablescape? Hi Tina, the turkey plates came from Pottery Barn a couple years ago. I can’t remember where the salt and pepper shakers came from, sorry! I love the way you tie everything together and make it so special. Very inspirational and gives me a “Can do” spirit! Thank you. Love your tablescapes. I started using your dishpan idea a few years ago and told my friends about it too. We all love it. It makes the clean up so much easier. There is less stress about the good China and sterling silver too using your method. You always have such good ideas. Thank you! What kind of wax do you use to make a sludge – to paint the pumpkins? What colors of chalk paint did you use for the blue pumpkin? It’s fabulous! Hi Karen! I used a tiny bit of dark wax and added a lot of clear wax. I’m hopefully going to find white turkey plates like yours pictured here..love them. We dine al fresco almost every year! Love it..a little bit extra walking but worth it. Awe my year plus anniversary of finding you and your amazing blog. I read the dishpan tip last year! Thanksgiving my fave food holiday if not fave holiday next to the 4th! There is a possibility that I will be moving from a country log cabin home to a traditional home with all white walls. As my décor has been “early attic” all my life, I have so much to learn. I love the pumpkins,acorns candles and eucalyptus. Beautiful ideas, I just recently found your blog and have really been enjoying all your ideas to inspire me. Welcome to the StoneGable family, Wendy! Light, airy, soft and natural. This is the mood I want to create on my Thanksgiving table and you’ve given me ample inspiration. Thank you! I love fall and Thanksgiving. I love the idea of the five kernels of corn. I always host Thanksgiving and I have always enjoyed the cooking, but the past few years I have felt very stressed trying to make sure everything is just right. I think I need to step back and look at the bigger picture. Thanks for your advice and tips. This is one of my favorite posts…love the dishpan idea. 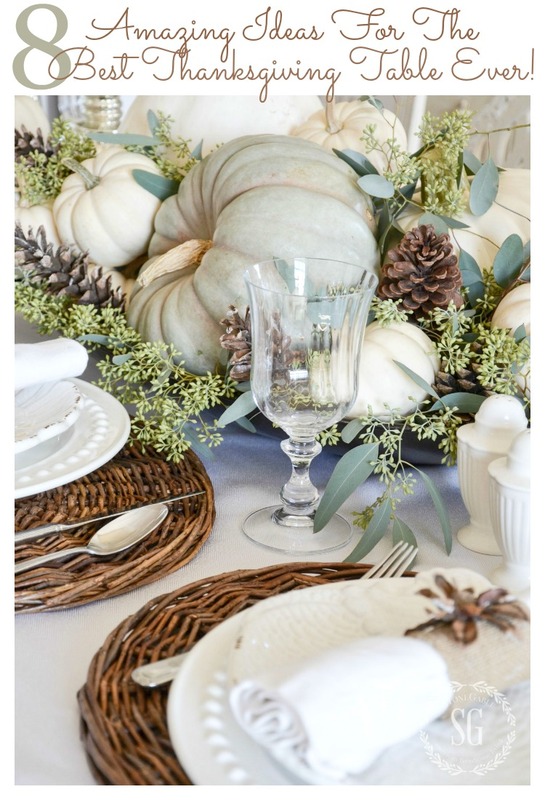 Love the beautiful pumpkin in that centerpiece with the eucalyptus. Thanksgiving is one of my favorite holidays…time together with family with not a lot of expectations…and nummy food. I love all your ideas. They are so user friendly! I also have plenty of buttons and plan to make the adorable napkin rings. Thanks ? Yvonne, just loved this post! You have such great ideas — love them all! You are such a blessing to all of us! Thanks, Yvonne, for being such a special lady. God Bless You! 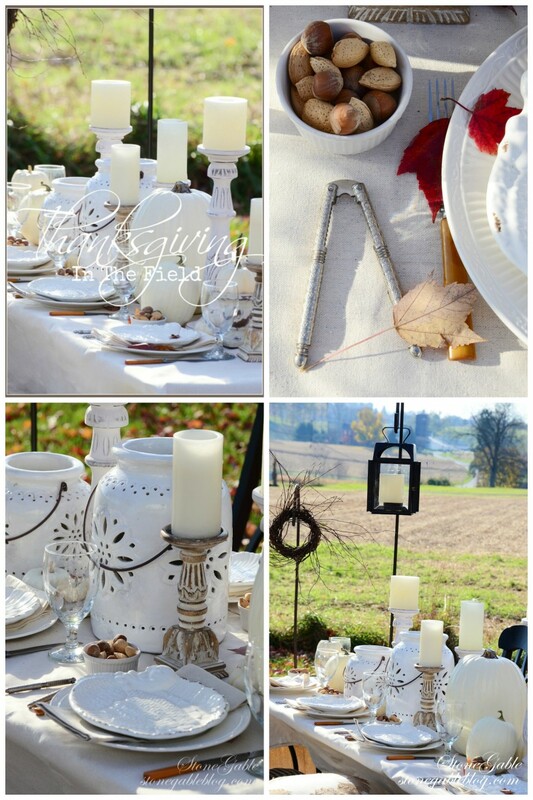 Your outdoor Thanksgiving table is so lovely! I Wish we could eat outside this year, but the weather would have to cooperate for that to happen. 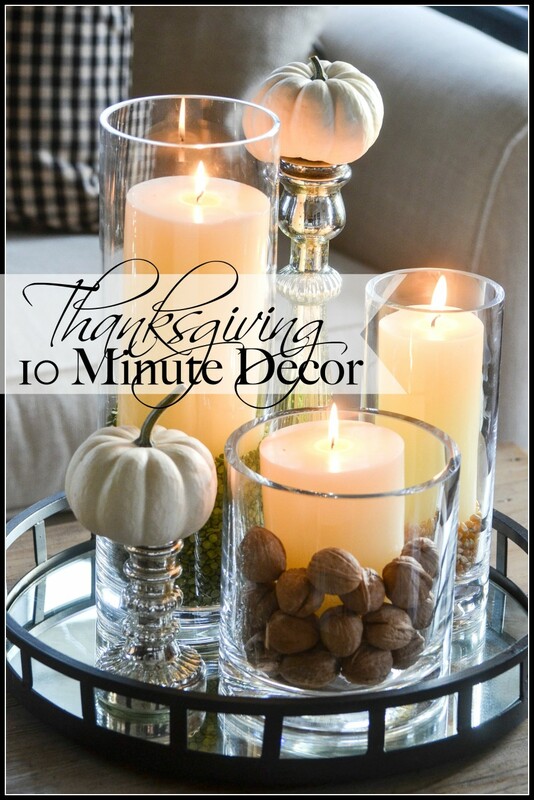 Beautiful easy ideas for Thanksgiving! Love the burlap ideas. Where do you get the seeded eucalyptus? I live in Lancaster and was just wondering? Love that idea. I’ve always used natural vines but I’m tired of that and need a change. This one is a really pretty one! I order it from a local florist. Try Petals With Style! Thanks, Yvonne, for the ideas about family traditions. I’m going to forward this to my daughter who will be our hostess this year. Love your ideas, what is the story of the five kernels of corn? Your table escapes always are so beautiful. I do my own take on yours sometimes. I’ m known for my table dec. thanks again for the impresperations. Wow, what a compliment coming from you! So lovely!!! I love your blog and have been following for quite some time on fb and pinterest. Would it be possible for you to share some of the pattern names of your dishes sometimes?? and where they can be purchases?? I would love to purchase some new sets!! Hi Bonnie, I am planning a post about just that thing! Inspirational, thanks. You’re sort of like a guiding light in my path back to an authentic life. How absolutely sweet, Rose! My greatest desire is to inspire my readers! Many have mentioned the “dishpan” idea, but I can’t seem to find it. Can you help direct me, please? Yes, click on the THE BEST THANKSGIVING TIP YOU WILL EVER GET in the post and it is all about the “dishpan method”! This project is just perfect for you, Michele! I love all these tablescapes! 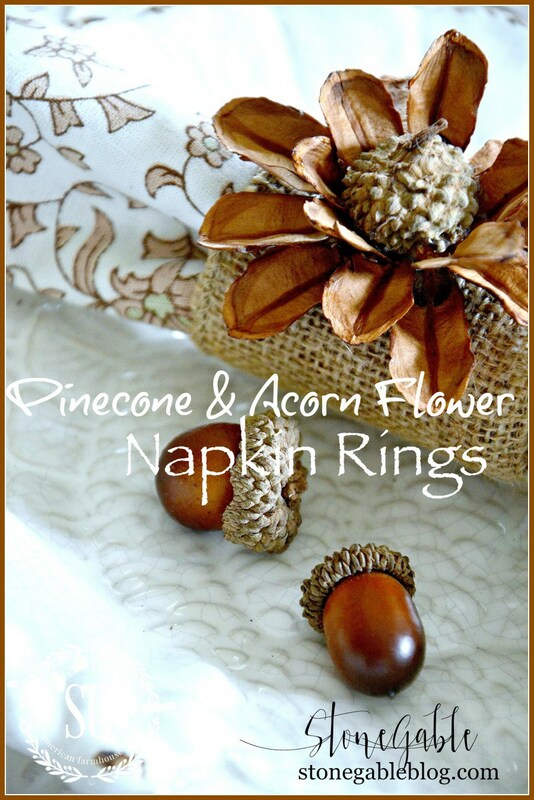 I fashioned my burlap napkin rings with acorns similar to yours, Yvonne. We had guests in last Saturday evening, and I received lots of compliments on them. Thanks for the inspiration! I also have a question. Most of these beautiful tablescapes are designed with pieces that are fairly tall. Do you remove some of them before dinner so guests on the opposite side of the table can better see each other? This question has stayed on my mind ever since I started following home decorating blogs. I’d love to know how you handle this. Hi Sydell, When I have company actually sitting down for dinner at my table, I make sure the centerpiece is not too high. Thanksgiving is usually about the turkey and heaps of food. We instead should thank God for all the wonderful blessings He gives daily. The five kernels of corn would be a way to do this. My daughter is hosting Thanksgiving. I don’t know if she will do this or not. As the hymn goes “Prsie Father, Son and Holy Ghost”. 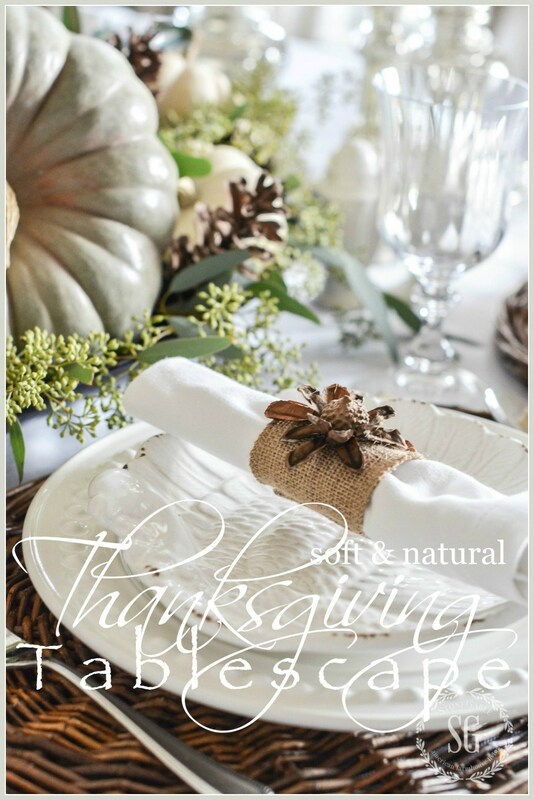 Lovely ideas for a natural and decorative Thanksgiving table! Love your ideas! Thank you for your inspiration. Thanks for the ideas Yvonne. I love the idea of decorating with pinecones and acorns. So simple but pretty. Love all your ideas Yvonne. 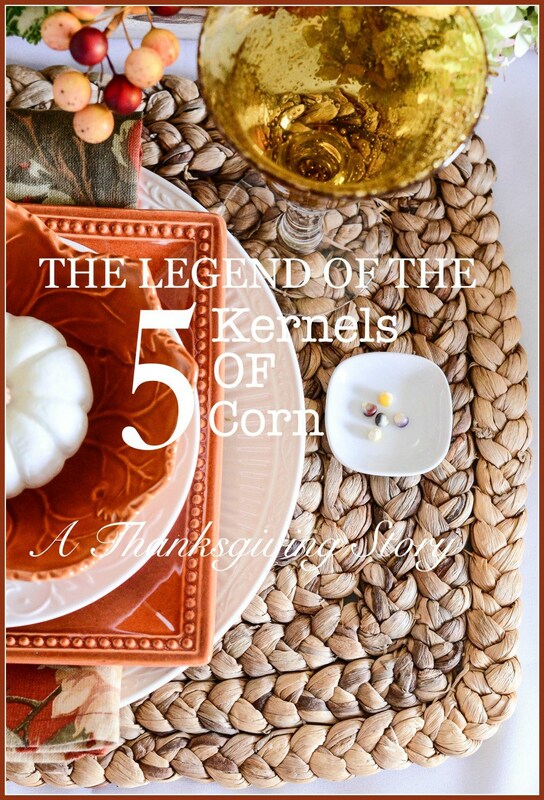 At Thanksgiving dinner I ask everyone to name something they are grateful for however, this year I’m going to incorporate “The Legend of the 5 Kernels of Corn” into my Thanksgiving and start a new tradition!! Thank you. Love your soft ,calm looking Thanksgiving table. Christmas is ALWAYS so much more hectic. Thanksgiving can be a fun day with no stress except the dinner.Its a relaxing kind of day! We host Thanksgiving every year, but this one will be extra special with a few new to our family guests, so I’m pulling out the stops! Thank you for the ideas, I’ll be incorporating several of them! Your centerpieces are gorgeous. Your tables look so inviting that dinner must be an enjoyable experience for everyone. They truly express your joy of decorating as well of your love for family. So glad you liked it Pamela! I am thankful for you inspiration and encouragement! What a wonderful tradition you have with the corn! Thanks for all the ideas and tips Yvonne! So much packed in here!! Love the center pieces. Still want to hear where you store all the pretties in your home! Lol! This year will be the first in many that I am not hosting–my daughter wants to ( of course she wants me to “help” cook—-(she is not a cook–yet…lol!) — so it should be interesting). Last year I felt all out of sorts in our rental because it threw off my normal rhythm, so trying to cook in her small kitchen will be a challenge. How do I “help” without taking over? I typically prepare many things in advance, or the night before. I don’t want to step on her toes or make her feel bad. Any suggestions? I love the idea of your daughter wanting to host Thanksgiving this year. Okay, you asked my opinion so I’m going to give it truthfully. Do not… I repeat DO NOT steal her Thanksgiving thunder. Not that I think you would but sometimes we, how have Thanksgiving down to a science, want to step in and take over instead of letting our grown children learn. She may do things differently and maybe not as smoothly, but she is learning and making memories too! Do offer to help her in any way SHE wants you to. Let her know how proud of her you are and let her feel your love! Be a helping hand and her best cheerleader! Thank you for sharing such wonderful ideas from both yourself and from others. I’ve been dragging my feet about fall decorating, but these posts have inspired me to get going! Your site just makes me happy, happy, happy! Love so many of your ideas it’s hard to choose just one! Thank you for your inspiration!! Oh Yvonne I just read your post about cleaning up after a guest visit. I really appreciate what you said about your home being a place for making memories and sharing life events. I come from a family of open doors and welcoming arms. Although the furnishings were not memorable, the fun we had definitely outshines everything. Somehow as I’ve gotten older I sort of forgot that in my own home and frequently feel crabby when I am getting ready for guests. Like it’s an interruption and a bother instead of a blessing as you point out. Like you, I work from my home office and also travel to places around the state during the week. It sounds like fun to describe but there are many deadlines and I struggle to keep up with it all plus keeping the home clean, my Mother looked after from 90 miles away, husband fed and see grandchildren when possible. When someone is coming to visit, it usually means marathon cleaning into the wee hours and work deadlines are left in the dust till it’s over. I do enjoy spending time with company but frequently have the uneasy feeling that something important is being shoved to the back burner while we play. Thinking about holidays coming makes me want to leave the country for awhile! 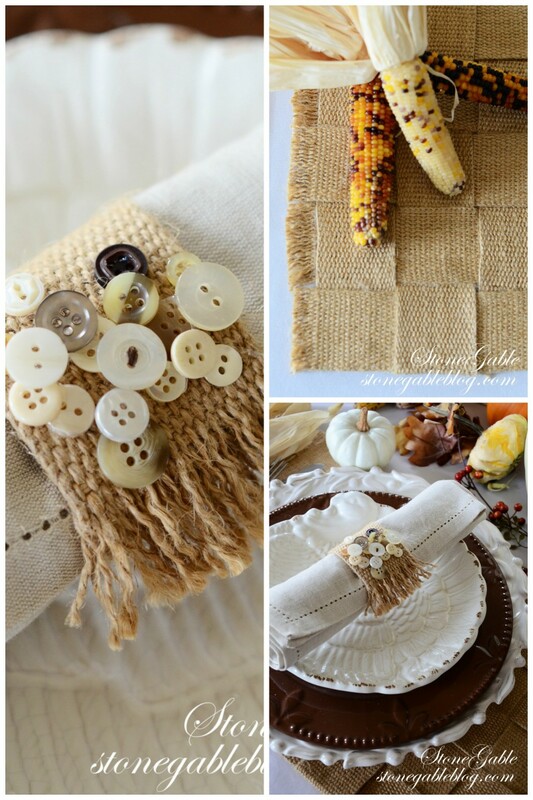 I am making the burlap napkin rings with buttons this weekend – LOVE THEM!!! Thank you for such a great idea! What a lovely Thanksgiving table. I just love Thanksgiving, and I always have a large crowd to host for dinner. I love all the wonderful ideas you give me for a wonderfully decorated Thanksgiving table! Thank you, your blog is so enjoyable! I agree with you about loving the Thanksgiving season. I like the natural elements that you incorporated on the table and the burlap. No eating outside here, but we can look out the window and dream! 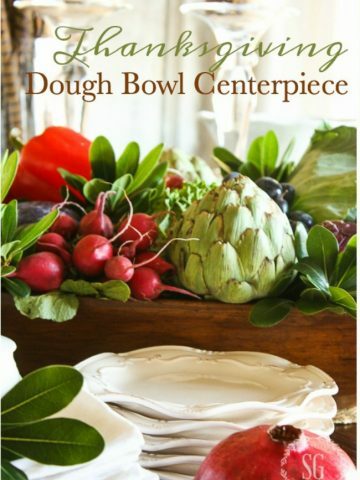 Beautiful tablescapes! I live in SC and we can almost always eat our Thanksgiving meal outside! Oh, I would love to do that!!!! Absolutely gorgeous, such a calm and serene setting. Love your blog Yvonne! I’m going to go out and buy dish pans today! What a great idea! Oh, you are going to have a much easier Thanksgiving! I love the 5 kernels of corn. We will have to incorporate that into our Thanksgiving. I love the burlap ideas! I’ve pinned it and plan on making it once I get my burlap. There is certainly a wealth of ideas here. Thank you, Yvonne! Hi Donna, I find them at vintage fairs. They are very popular right now!